MountainWest Capital Network Releases their list of the 100 fastest growing companies at awards program. Jive has seen exponential growth in the last couple years. We're proud to be a thriving Utah tech company. 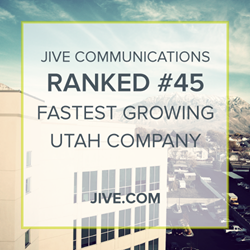 Jive Communications was ranked one of the top 50 fastest growing companies in Utah by MountainWest Capital Network (MWCN) at the 23rd annual Utah 100 Awards Program. The 100 fastest-growing companies in Utah received recognition at the annual program which was held at the Grand America Hotel in Salt Lake City. This year’s ranked companies were chosen by the percentage of revenue increase between 2013 and 2017. Other recipients of the Utah 100 include Jane.com, Workfront, Instructure, and Pluralsight. MountainWest Capital Network (MWCN) is the largest business networking organization in Utah, consisting of entrepreneurs, venture capitalists, consultants, legal professionals, bankers, and educators. MWCN seeks to promote and recognize business growth and capital development in the state through a variety of award programs and activities.